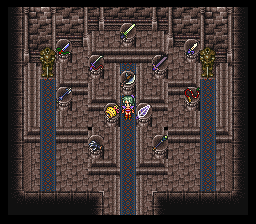 Final Fantasy VI T-Edition is an ambitious japanese ROM hack by user @tsushiy. 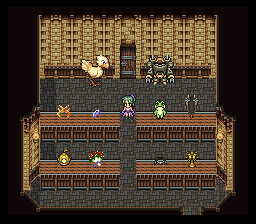 It features many new events, bosses, song, magic, skills, espers, a dressing room, a museum, a developers room, a music player and a new game+ feature. You can read a more in-depth review here. There is also a EX patch that allows to play past the ending with another ROM to beat more bosses and explore new areas. 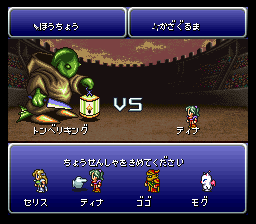 The hack is for a Final Fantasy 6 (J) ROM. Poemato CX made a live translation in 2015, you can view it here. There is also the OST available in this playlist. The hack is in Japanese but that doesn't stop English speaking people from playing it! It's an amazingly incredible hack. I can't fathom how the hell he's done all that's been done, but it's awe inspiring at times. Been playing it (as Madsiur already knows) to get clips for the Youtube video, but now I'm freakin' hooked! I'll have to do a legit playthrough sometime after this cheating one. This is such a beast of a hack, it's amazing the things Tsushiy have done and we have so much to learn from this. I really want to understand how the expansion of the enemies and esper lists were done. seibaby Wrote: I really want to understand how the expansion of the enemies and esper lists were done. I've already done a monster expansion test (see this post). 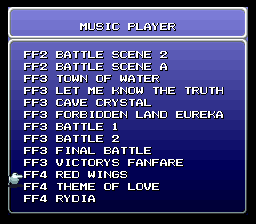 I'm really impressed about FF6-T items expansion (which I tried to copy but it's a nightmare), tilesets expansion, maps expansion, music player and monster expansion given the lack of Japanese tools to edit easily those, unless Tsushiy had the help someone that coded special editors. I know item expansion was made by someone else as he used a Japanese base ROM for his project that had already a lot of ASM improvements in it. I have the Japanese music player ASM file somewhere, it's just really hard to cross-reference the $C3 routines hook-ups since Japanese and US $C3 routines are not at the same offsets in the disassembly, there's always minor to decent (~0x200 bytes) difference in a routine starting offset when you compare both. wait... map and tileset expansion? That's literally the last thing I want to be able to know how to do... I had intended to get into researching it at some point, but we all know how that goes. (04-25-2016, 08:35 AM)B-Run Wrote: wait... map and tileset expansion? That's literally the last thing I want to be able to know how to do... I had intended to get into researching it at some point, but we all know how that goes. If I can say this in one sentence, a lot of data (excluding molds, spells and items) are relatively easy to expand. The problem comes when you need to edit the relocated (and expanded) data. It's already a chore to insert / edit manually a new working monster sprite or even monster data, I don't imagine how tedious it must be to edit a new tilemap manually. Tsushiy surely has custom editors to work with. Maybe not for everything but a custom FF6LE build is probable. The way I had envisioned it in my head (without actually learning much about the maps), was to have basically a second set of compressed data that can be called instead of the original compressed section... so basically you would make all the edits in another copy of the ROM, then grab the entirety of the map data and plunk it into free space in the final ROM, then have a branching bit that tells the game which set of data to load... that way you could still use LE and so long as you have a way to set/unset the branching bit via event or custom code... you would be set... but again, that was without doing any real research, so that could make no sense whatsoever. Yeah we did some research on their item expansion (tsushiy told me he has no idea how it was done, which indicates to me somebody else did that code) and it is not easy to replicate. I was coming across RAM that didn't match up with the US version's code, and it also requires SRAM expansion, which I've been told is fairly complex to pull off. Yeah I've disassembled most of item code changes in banks $C1, $C2 and $C3 from FF6-T but RAM used in the $7EEXXX area does not match the US version. I have come across this hack through your forum and I am so incredibly sad I do not speak Japanese. Do you or does anyone know if there will ever be any effort to translate this? I have thought about trying to play and watch the live playthrough to supplement but it seems daunting. I am really dying to play and enjoy this, it is my favorite game and I am always looking for new hacks!